Style Life Fashion had the opportunity to speak with Celebrity Hairstylist, Dean Banowetz. This was a great opportunity because Dean shared tips on revamping your hairstyle; how to use quick and easy tools while demonstrating three looks that we can use at home. Click on the link below to join Dean as he educates us on summer style tips. From a farm in Iowa to the bright lights of Hollywood, Dean Banowetz, also known as “The Hollywood Hair Guy”, has made his name as a key player in the world of celebrity hairstyling. With a wealth of knowledge and experience, a detailed eye and an individual approach to styling, Dean has carved a niche for himself as one of Hollywood’s go-to hair stylists. After attending Cosmetology School in Iowa and later spending time training under Susan Lipson at the “On Set Motion Picture Hair Academy,” this Hollywood hair mogul landed the prestigious role as EXTRA host, Leeza Gibbons’, personal hair stylist. 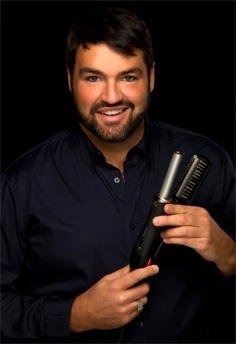 Following his debut on the scene, Dean’s outstanding work took him to the set of American Idol, to style host Ryan Seacrest’s hair, as well as the show’s talent. Today, Dean devotes his time to his career as a full time Hollywood Hair Stylist getting his A-list clients including Jennifer Hudson, Carrie Underwood, Ellen DeGeneres, Leeza Gibbons and Ryan Seacrest red-carpet ready. Dean’s devoted clientele count on him to get their tresses in tip-top style for high-profile events such as The Academy Awards, The Golden Globes, SAG Awards, Grammys and much more. In addition to developing a loyal celebrity following, Dean has also spent time sharing his expertise on top-rated television shows including the Oprah Show, Tyra, Soap Talk, The Wayne Brady Show, Fox News, NBC’s Today Show, Dateline, EXTRA, Entertainment Tonight, Inside Edition, Access Hollywood and most recently Shear Genius. His beautiful work has been featured in fashion and beauty publications worldwide including Vanity Fair, Details, People Magazine, Us Weekly, Newsweek, TV Guide, Shape, Italian Vogue, Glamour and Redbook.